It’s no secret that the consumer is in total control when it comes to marketing. The challenge for many marketers is understanding how to better connect with the target audience. We must get into their minds and understand their needs, interests, likes, dislikes and habits to create experiences that will resonate and add value to their lives. One way to achieve this deeper connection is through customer-first marketing. You may have heard this phrase before, but what does it actually mean for marketers? 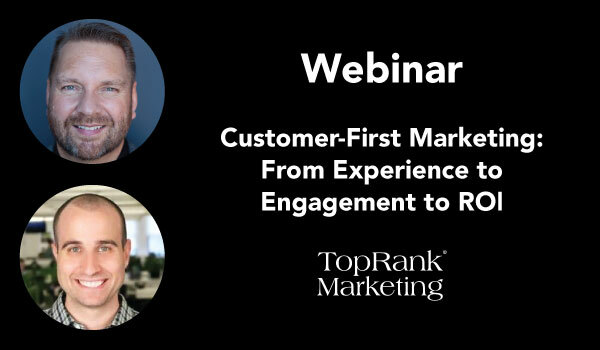 To help answer this question, join TopRank Marketing CEO, Lee Odden in a new webinar series, The Value Add, hosted by Conductor CEO & Founder, Seth Besmertnik, as they dive into this topic to get a clearer picture of how your brand can focus your strategy on the customer experience to provide true value at every stage of the buyer’s journey and make a deep connection with your audience. Below are all the details, you’re not going to want to miss this! It’s 2017, and marketers have woken up to a customer-first world. The days of the captive advertising audience are over — consumers control the market, and it’s our job as industry leaders to transform our strategies to meet their needs. We’ve all heard the phrase “customer-first marketing,” but what does it really mean for marketers, now and in the future? Join the conversation with two leading industry figures, Seth Besmertnik and Lee Odden, as they dive into how businesses can transform their organizational mindset to win in the customer-first era. Ready to Attend the Customer-First Marketing Webinar? It’s easy, just click the link and register!